A truck came by with field hands riding in the back; their water coolers already dusty, their eyes resigned to another long hot day of running pickers and tromping cotton down in old iron trailers until the final rays of a hot August sun melted into the orange sweat of night. Crop dusters fly overhead circling like large mosquitoes reading themselves into a dive bomb as they showered defoliant on the unsuspecting leaves. Those that grew up here are say, “I love the smell of defoliant in the morning!” The first time I came here was in harvest time. The first thing I smelled was defoliant. I held my breath certain I would be gassed an irreparably damaged. “Won’t we all be poisoned?” I asked Leo. “Oh baby, now that’s the just the perfume of a season coming to a close, he said.” “It is really strong I hope it doesn’t asphyxiate us.” I covered my nose and mouth hoping somehow the scent of my jasmine hand lotion would filter it out. Ah, no. I decided I would be more objective and really explore this new scent upon my olfactory. Underneath it, in a layer all its own, is a musky woody smell. The white earthen carpet is a field of its own kind of Oz poppies that lulls me into a meditative response as incense does. The once leaves of green are crackling into brown, dropping off leaving only stalks. As more and more pods of cotton pop and fluff out the air is imbued with a mushroom smell, organic and clean, the original cotton of our lives. For a little town there is a lot of activity so early in the day. By sunrise the entire town was hustling to get their crops out. By noon they will have already worked six hours. By sunset they will have clocked in 14 hours; city people have no idea what goes into farming. It’s seven days a week no holidays, no weekend summer barbeques; no time to just hang out, at least not for us. Life has to fit in here somewhere the best it can amid the clamoring of making a living and literally putting shirts on the backs of America. There are clumps of cotton alongside the roads edge gathered like snowdrifts where they have flown out of the trailers on their way to the gins. The air is thick with a musky hemp scent as gin trash burns in a haze of morning fog and smoke. I was afraid to breathe. To them it smells lie home and the end of another season. For once in my life I wasn’t busy. It is such an enviable status for a woman like me. I had always worked two jobs or more; struggled to pay rent, fought to stay free even in my darkest of economic resources. But now that I was in Portland, I had time, time to finally do all the things that I had ever wanted; time to write, time to read, and time to compose all those songs that had been piling up like unfolded clothes. It’s funny how when the chance finally came to do these things I was dumb struck by the droning quiet; it’s true, silence is deafening. The rhythms of my previous life were still motivating me like a push pull toy that clacked restlessly across a wooden floor. I had no one to do anything with, nowhere to go with and no one to do anything with. I was stuck here probably for forever and I better find some way to get use to it. Meanwhile life goes on in a swift momentum of getting the crops out before it rains. I am impressed with the devotion and care that these farmers give to their crops. It is truly a blessing to us all. The day started off simply. In one run together breath I clamored out loud, “I am here what do I do today?” I got up, made my bed, drank my coffee, ate my loving from the oven and went for a walk around a very short block remarking that the trees were all tremendously tall on 3rd Street. Martha Pugh told me that these Oaks were planted for each one of the native sons of the civil war. The civil war! I was breathless. There is a history here that defies present day with lingering pockets of a rich cultural past. At one time the town was built on Bayou Bartholomew. *1 “Down the bayou from Siemons was a small settlement referred to by steamboat captains and hands referred to as “the port”37 When a post office was established in 1857, the name became Portland. One had to reach it by ferry or ride the steamboat that navigated up and down it bringing supplies to the little towns that dotted its winding lifeline for 2oo miles. 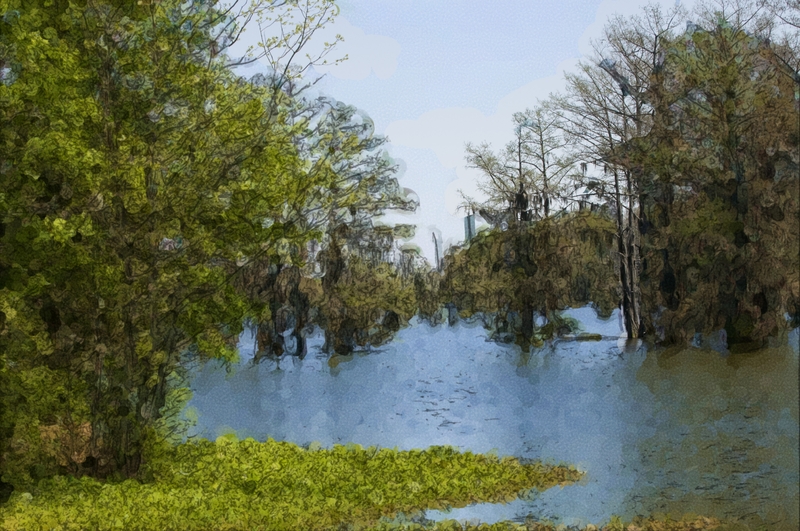 *2 Pearl Etheridge Young wrote of crossing the bayou by ferry with her father in the early 1900’s. Leo and I trolled in a little fishing boat down that part of the bayou. He loves the bayou. He tells me that he use to ride his horse along here as a kid with his life long friend since the age of five, Dave Hackett. They would set up a camp, run trot lines and live out their own Davey Crockett dreams. Once they forgot to bring food, and didn’t catch any fish, so they shot a black bird for supper. It was the “toughest meat they ever ate,” he said. I am searching for this mystical portal into the past. It was all that people had written and said about it, haunting, ancient, and removed from contemporary times. The trees and the waters clung to its centuries as to not ever forget the people who once traveled and lived here. Native Americans still echoed down this murky avenue. It was their souls that I felt the most. It was then that I saw a panther, her ebony eyes, stopped and stared into my soul and then slipped invisibly through the Cypress shadows. She hauntingly impressed me with her captivating presence. To this day I never saw her again, but always sense her somewhere near in my spirit. I took her to be a sign from the Grandfathers. I respect the Native Americans that lived here so abundantly at one time. The age of the Indian, the story of the spirit that permeates in the trees and runs in the waters here like life’s blood is always nearby. This bountiful land is pregnant with possibility, but somewhere along the way the sadness of their departure lingers and longs to be remembered with honor. “I hear you Grandfathers,” I say to myself and burn some sage in their memory. After a fire, which was suspected arson, the town of Portland was moved inland. It looks like a run down movie set with a block of buildings facing the still running railroad tracks. The town use to have a lot more going on then it does now. Back in the 1990’s, everyone came downtown on a Saturday night. I can almost still see the old model T’s gathered in a stylish black line, the men all wearing top hats and women politely sipping tiny cokes in long dresses while children run behind in the alley. I am told there was an old hotel, a Chinese laundry, taxidermy, a Portland Drug Store, run by CC Stevens where one could get a soda and prescription. Miss Pearl had a dry goods and ice cream parlor where Gays Grab bag now stands. I feel honored to be living here. It is not often one is lucky enough to reside in a town that was born out of the Louisiana Purchase. I wonder what the ancestors would say about a Yankee girl walking around in their footsteps.